With the reliability, durability and solid 4-wheel drive capabilites of the Toyota Tacoma, it’s obviously a popular choice amongst camping enthusiasts. Though it’s is a small truck, there are a handful of manufacturers producing a Toyota Tacoma camper. The Tacoma Habitat Shell (pictured above) would be a handsome, yet functional piece of camping gear for your cherished Toyota Tacoma. 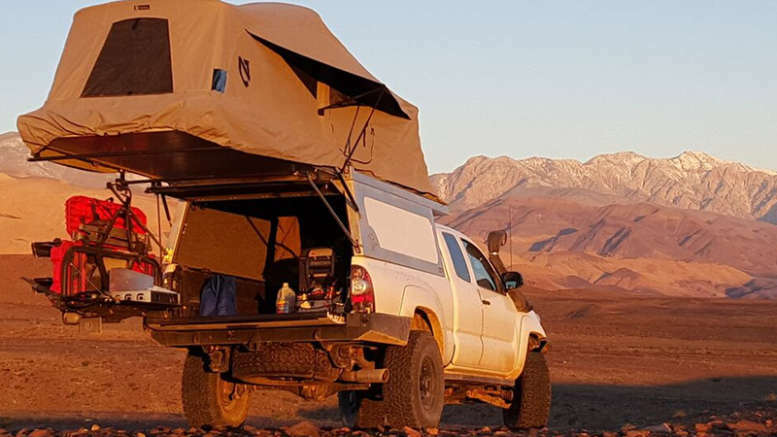 Manufactured by AT Overland Equipment, the Tacoma Habitat was designed to fill the bridge between a traditional truck topper (camper shell) and a slide-in, cab-over truck bed camper. Habitat’s fold out top allows you to stand up fully in the bed of the truck, while being sheltered by the all season tent. Sleeping bed capacity: 600 lbs. 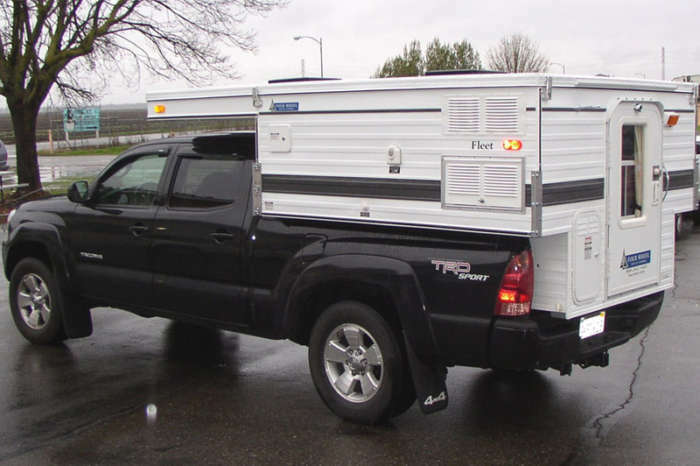 The Bobcat small truck camper fits 6′ beds including the Toyota Tacoma. The Bobcat is made by All Terrain Campers, with over 30 years’ experience inthe industry. It’s approximately 900 lbs. and includes multiple floorplans. Loads of standard features and options are available. 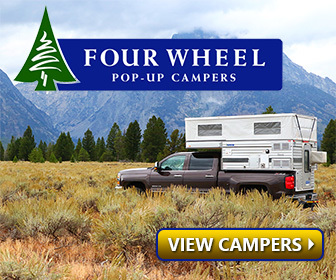 Made for small trucks with 6′ beds as well, the Fleet Model is made by Four Wheel Pop-Up Campers. Many standard features and options are available. Interior headroom up to 6 feet, 4 inches when popped up. Sleeps up to 3 adults. Queen size cabover bed and couch/bed conversion. Aluminum Roof/Wall framing and exterior. One of the newest camper options for the Toyota Tacoma on the market is Earthcruiser’s GZL 300. It’s constructed of ultra-lightweight composite materials and molded into a one-piece design that is well insulated. The days of bulky, roof-mounted solar panels are starting to become history. And this is no exception on the GZL 300, which is capped with 2 100 Watt Zamp flexible panels that weigh less than 5 lbs each. Flexibility means they essentially flush-mount to the curved roof, eliminating wind drag. Amenities include 1.5 cu. ft fridge/freezer, 22 gallon freshwater tank, 9 gallon grey water tank, 2.6 gallon water heater, 2 burner propane stove and a 3 gallon propane tank. 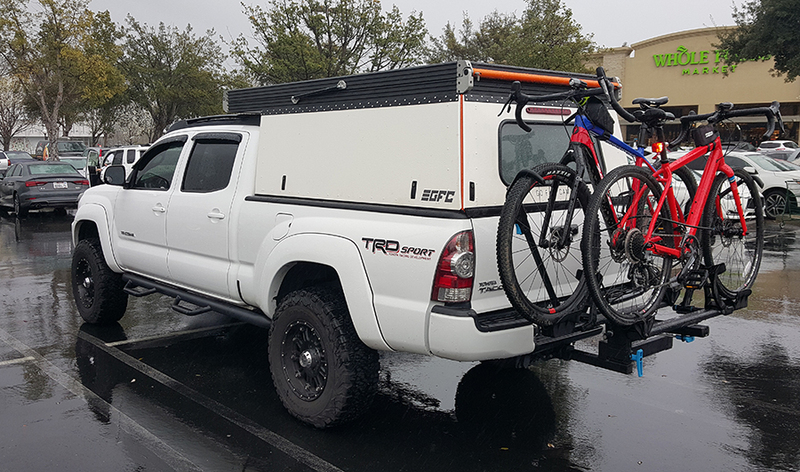 We spotted this sweet Tacoma/Go Fast Camper setup at a nearby Whole Foods market, stocking up on food for their next trip. Specifically called the GFC Platform Camper, the top platform pops up to reveal a seam-welded tent/bunk with zip open windows. When collapsed, the minimal cabover portion of the camper is only 6″ thick. Toyota Tacoma Helper Springs – Medium Duty rated up to 2,000 lbs. Hellwig EZ-990 #981 – 2005-2013 Toyota Tacoma 4wd and Pre-Runner (except TRD). Hellwig EZ-990 #979 – 2005-2013 Toyota Tacoma 4wd and Pre-Runner with TRD package. Hellwig EZ-990 #980 – 2014-2019 Toyota Tacoma 4wd and Pre-Runner. 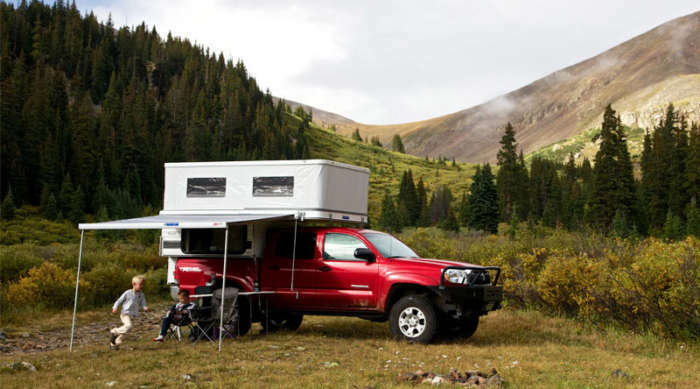 4 Comments on "Toyota Tacoma Camper: 5 Different Brands for Your Favorite Mid-Size Truck"
This site is very helpful to researching Tacoma camping options! EarthCruiser GZL 300 – Looks like it fits a shortbed Tacoma…how about my 2018 longbed Tacoma? How much the basic unit? 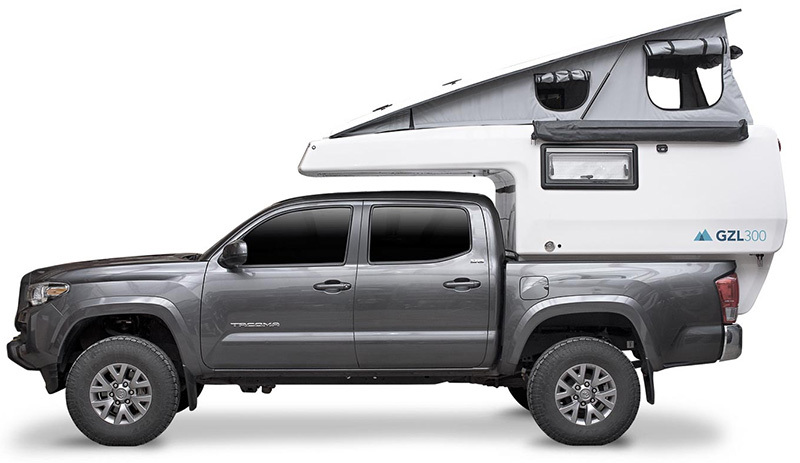 Looks like Earthcrusier offers an “extension” for the GZL 300 to fit Tacoma longbeds, where an outside cargo compartment is added to fill the space between the back of your truck cab and the camper. 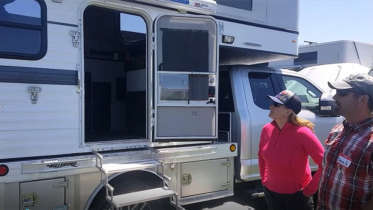 It also appears they were offering the GZL 300 camper last summer for about $36K. Finding a truck camper to fit your Toyota Tacoma is beyond obnoxious. I went through this struggle myself for almost 6 months until I finally decided to bust out the saw. Any truck camper under 7 feet will fit any Toyota tacoma. You just need to shave one corner back an inch or more for it to fit in between the wheel wells. I bought a Sun Valley 690 Truck Camper which means it is 69 inches long. Perfect as long as I run with the tailgate down. I also installed a bathroom and a shower in camper that only had a 69 inch base. I had to run my own water lines, but they are only 20 cents or less at any hardware store. I also installed 3 stage water filteration system and a 2 panel solar power setup. As well as a pantry storage for food on the back side of the bathroom. To create the bathroom I framed it out with 2×2’s. Covered both the interior and exterior with peal an sick vinyl flooring. Inside looks like a stone washed highend bathroom you would see in mansion and outside looks like an exotic African wood. For the shower basin companies wanted 2-3 or $400 for a shower drain plastic mold basin. So I went to home depot and purchased a laundry room sink for $35 and cut it to fit to size and fused it back together after the cut. I now have a truck camper that fits my 2012 toyota tacoma that includes solar power, full bathroom, three stage water filteration system, cargo roof rack, side mounted ski racks and a trailer hitch custom made deck/step system that costed me less than $1,000 for all 5 modifications. I did have to install the air bags suspension which you can find from the link within this post. Firestone is a great company. I purchased mine off of Amazon and my first delivery came with a busted seal. They sent out a whole new kit no questions asked no extra money, and now I have one extra air suspension bag in reserve. Helped wonders. Took me a while to figure out the proper inflation, which for me was 75 psi, but after I figured that out truck drove normal and stable. No squatting or squishy back end. If I didn’t install the airbag suspension I most likely would have destroyed my trucks suspesion. Upgrade your suspension and tires. Get a set of 10 ply tires and you’ll be all set for this type of setup. I have been living full time in my truck camper now for 5 months and love every second of it. Have a 48 inch flat screen TV mounted to the wall of the bathroom. Installed my own vent fans which you can do with any radiator fan for under $20. Cook top works great. Sink works awesome. Shower needs a hot water heater, and I am thinking of installing the camp chef water heater, but other than that it was the best decision I have ever made. With all the modifications I have made I still saved thousands of dollars that I would have had to spend on a bigger truck to haul a bigger camper. Its perfect, and you can have the exact same thing. Just need to get creative and bust out the saw.